This writer was going through an interesting story (with a tint of humour) in a parenting blog the other day. The story listed few fundamental skills Sri Lankan children should master before they leave their schools. One of those practical skills was learning how to prepare a variety of rice and curry meals. The blogger had a good point. While agreeing with her, this writer would like to add to the list that children should not only learn how to cook, but they should learn first-hand what it takes to get their food from the field or the farm to their dinner table. The best way to give them this information isn’t from YouTube videos but from systematic teaching and helping them gain real-life experiences. More than that, agriculture should be, and can easily be, incorporated into core subjects like math, science, technology and social studies. Teaching agriculture in schools is not a new concept. Years ago, a local university professor made a strong pitch for introducing agriculture as a subject right from the primary school in rural and semi-urban areas. He said the objective of the move should be to ensure that those who do not take up graduation and postgraduation can acquire basic education on agriculture at school itself. Since the educational courses on agriculture and allied subjects begin at graduation-level, the introduction of agriculture as a subject from the school-level would help increase the number of persons undergoing basic education on agriculture. This in turn, the Professor said, would have a positive impact on nation’s agricultural development. The Professor also commented that the general education courses are important because they are considered a foundation for student education. However, he added, courses like agriculture offer professional development skills and put students in real-life scenarios. Sri Lanka is an agriculture-based country. About four-fifth of the districts of Sri Lanka are considered as agricultural, inhabited by over 60 percent of the total population. Employment in agriculture (as a percentage of total employment) in Sri Lanka was reported at 26.68 % in 2017, according to the World Bank report. Mainly, family-owned small sized farms constitute agriculture sector as the number of commercial farms is low. A dynamic and inclusive agriculture development could help in the reduction of rural poverty and thereby help the given country to realize the Millennium Development Goals on poverty and hunger. It is here that the trained agricultural professionals could assist the Government in formulating the right policies for the agricultural development of the country. And it is here that we need the students to acquire knowledge and practical skills in agriculture from the early years in their lives, so that they could prepare themselves for further academic development or agricultural occupations. To make it a reality, agricultural science needs to be a subject compulsory in all primary and secondary schools, so as to develop and improve effective learning of agricultural science among all students. In this writer’s opinion, there are three basic objectives to be pursued when agriculture is included in the school curriculum: (1) Teaching basic scientific procedures and introduction to the general methods and logic of agricultural science: (2) Teaching practical skills and knowledge in agricultural science: (4) Reducing the migration of school leavers from rural to urban areas. As can easily be seen, these objectives are interrelated and are also linked to overall national goals. It might be useful to take a brief look at the links between the various objectives. n Pre-vocational training means providing knowledge, skills and attitudes that will be directly useful for agricultural activities. It does not constitute a full-scale professional training. Rather, what they learn in agriculture should prepare them for real professional training later on. Also, agricultural skills, it is argued, will enable rural young people to earn their living in their home areas. n By introducing agriculture into the syllabus, we can expect to create an environment-friendly younger generation who will appreciate manual work. However, the complete attitude transformation towards manual work is also shaped by cultural traditions, early childhood socialization, parental- expectations and attitude of teachers etc. n Agricultural teaching can also be used to train basic principles and procedures of science. Scientific methods can be taught on the school farm or garden at very little expense. Experimentation and observation, both short- and long-term, are perfectly possible. 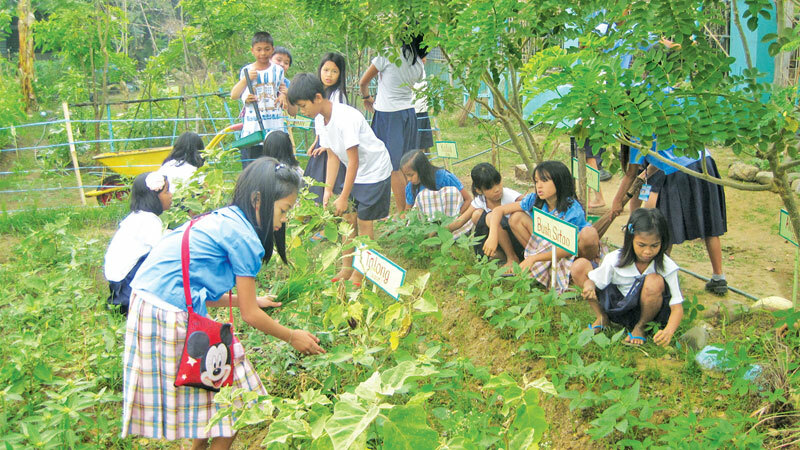 Teaching agriculture to young school students opens them to understanding how things grow, live and die. Starting agricultural education at a very young age helps children get perspective on their lives and the world around them. For example, teaching agriculture in primary school classrooms introduces young students to basic scientific procedures and shows them how to apply these lessons to daily life. An agriculture instructor can teach students about how bees make honey, how trees grow and make fruit or nuts, and how coconuts can be made into oil. Agriculture puts chemistry, biology and physics into everyday-life application. School farm is also a component of the school activities which has link with the birth of a more productive agriculture. It is a selected plot of land in the school environment where students’ carryout practical agriculture both in crop production and (if space permits) animal husbandry. This helps the students to acquire knowledge and practical skills in agriculture and agricultural related opportunities. It will provide students with supervised occupational experience in agricultural productivity and encourage the use of records and reports similar to those used in agriculture. The school farm as very important in giving students practical experience, promoting agricultural skills by giving the students opportunities to carryout demonstration plots and conduct agricultural experiments among others. Nigeria is one of the countries who managed to implement school farms successfully. Yet in their initial years, they also faced few problems, such as lack of tools, equipment and other capital items and lack of seeds, feeds, fertilizer and other operating suppliers. They also faced inadequate training for teachers to use the farm for instructional purposes. However, within few years Nigerian government managed to overcome these initial problems. The book addresses the importance of school gardening and agriculture education to community life. The school students can develop skills in leadership, communication, team building and civic engagement through inter-curricular programs in agricultural education. They learn about the importance of farming to a community, and learn to work together in planting gardens and in discovering how their community provides food to the public. Attracting and retaining high-quality staff to teach agriculture will be difficult for a number of reasons: the poor public image of the agriculture sector, the perception that there is little opportunity for career progression and a lack of professional development for teachers of agriculture and related disciplines. The Government should consider introducing a scheme of agricultural teacher education scholarships for new teachers and for those willing to re-train to learn to teach agriculture. Their salary scales may also be adjusted to meet up with the demand. Other incentives to attract teachers should also need to be investigated, including adequate access to professional development resources for teachers. It may also be worth considering funding few more training institutes to provide specialist teacher training in agriculture.